As a person walks, the movement of calf muscles works to circulate blood back to the heart. Compression socks work by applying external pressure to the leg to help promote blood flow towards the heart. Wearing compression socks will support your veins and increase circulation, reducing swelling and the feeling of tired, achy legs. Wearing socks is important for the prevention and treatment of varicose veins and other circulatory problems. They can also be helpful for those that stand or sit for long periods of time, such as at work or on long trips. 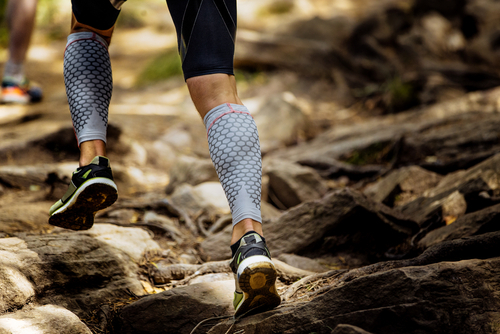 Compression socks are also used by athletes to improve circulation during marathons, biking, and other activities. There are different levels of compression that can be used. The 15-20mmHg compression is considered over-the-counter and can be easily sized by shoe size or ankle circumference. For higher levels of compression, any one of our certified compression stocking fitters can properly measure your legs and help you select the right stockings for your needs. Measurements are best taken in the morning when there has been little swelling in the legs. This ensures the most accurate measurements are collected, so your stockings will fit you perfectly. We carry the full line of Sigvaris compression socks including lines for men and women in a number of styles, fabrics, colours, and sizes. You can learn more about Sigvaris and compression stockings on their website. Or contact us today to book an appointment and to learn more about how compression stockings can benefit you.